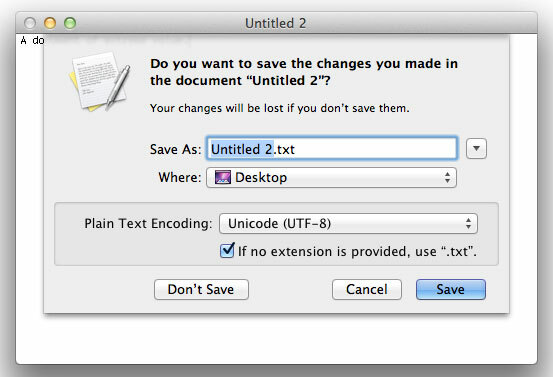 The standard and thus ubiquitous save sheets (document-modal dialogs) in Mac OS X have for years supported keyboard shortcuts for triggering the main buttons. With the release of Mac OS X 10.7 “Lion” yesterday (read my review of it at The Guardian), there are a few changes to those shortcuts. This brief article describes them. Save can be triggered with the Return key. Cancel can be triggered with either the Escape (Esc) key, or by pressing Command-Period (Command-fullstop). Don’t Save can be triggered with Command-D. The new keyboard shortcuts are more logical, more convenient, and safer. Save can be triggered with either the Return key, or by pressing Command-S.
Don’t Save can be triggered with Command-Backspace (the ‘delete’ key above the Return key). Since the user will probably associate Command-S with saving (it triggers the Save menu command, after all), it makes sense to also assign that shortcut to the Save button within the sheet. However, that creates a problem: the previously-standard Command-D shortcut for “Don’t Save” puts two opposing commands on adjacent keys (since S and D are adjacent on a QWERTY keyboard). It would be unacceptable to invite the inevitable physical slips this would cause, so “Don’t Save” is now triggered by Command-Backspace (which is an excellent shortcut, since not saving means your document’s contents will be deleted, in a sense, and hitting Command-Backspace is slightly more difficult than hitting Command-D). Here’s hoping that apps which roll their own save dialogs/sheets will adopt Command-Backspace for “Don’t Save” soon. As I’ve said before at conferences and elsewhere, dangerous actions should be a little harder to perform than safe ones.